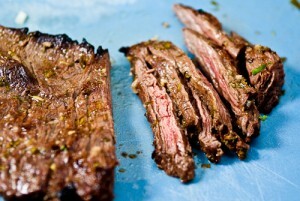 Grilled beef with Mexican flavors! Super simple carne asada/ grilled beef tacos! Serve on top of warm corn tortillas. Mix all ingredients in a bowl and stir with a spoon. Grill the steak until cooked to your liking. Warm the tortillas, add toppings, and serve!